Welcome our new Studio Manager, Sue Anderson! For years I’ve said that I began my yoga practice to manage back pain, but I’ve come to realize that wasn’t the entire answer. Even from my first days on the mat, I was there out of curiosity. Many years later, this still holds true. Yoga offers us an ever-changing mind body exercise that can encompass every aspect of our beings, giving us a place to grow stronger mentally, physically, and emotionally. Every day, there’s something more to learn. In 2016, I had the good fortune to complete the 200-hour yoga teacher training program at Empower Yoga in Appleton, Wisconsin, and have been teaching ever since. 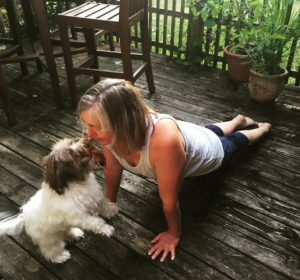 While I will always appreciate a fast, sweaty flow, recently I’ve been focusing on a gentler approach to yoga, making it accessible to a broader spectrum of our population. Outside of the studio, I have a bike-mad husband of many years, a wonderful teenage daughter, and a crew of cats & chickens fiercely guarded by our little Havanese dog, Suki. Hope to meet you on the mat at the Lake Mills Yoga Co-op!